Random happenings and thoughts from my groovy life. I've not fallen off the face of the earth. Life just caught up with me, and I've not had a lot of time for blogging. So here's an update of my family. Me: I'm working as an assistant accountant at the local state community college. Our fiscal year is winding down at the end of this month, so things are beginning to get hectic there. I do Accounts Payable, so that deals with purchase orders and writing checks. I also do the accounting for our Restricted Funds, which are mainly grants. Anyway, I stay busy. Kevin (Husband): He does lots of woodworking, which we sell for extra income since I only get paid once a month. We have a booth at a local store which has been doing pretty good. So he helps to keep it stocked. We're also trying to get another Etsy shop going. It's up, and we've had a few sales. Justin: He has 3 kids, Millie, Maddie, and Finn. Unfortunately, he is now divorced. He is staying with us while he gets accustomed to paying child support. He gets the kids every other weekend, except he was able to have them more often over the summer when they weren't in school. More about them later. Chase: He moved out and in with one of his best friends. They share the rent and utilities. He has a great job at a place that bottles various types of oils. He makes good money, and he bought a souped up pickup truck. Jordan: Jordan works at the local golf course while he attends Jacksonville State University. He is pursuing a bachelor's degree in Emergency Management with a minor in Homeland Security. His classes are all online, so that helps a lot. So there's an update since it's been so long since I've blogged. I really need to get back to it. Hopefully, I can. My heart is heavy for a dear lady I know. This lady has been battling cancer for several years now. Just yesterday I heard that she has stopped all treatment and is now under "comfort care." It's so sad. I'm not real close to this lady, but we share some similarities. She has 3 sons, like I do. Two of her sons went to school with Chase and Jordan. They played football together. She and I were both a part of the parents that sat in the stands cheering on the team. We attended some of the same show choir competitions. Now, her fight is about to end, and I can't help but think of those 3 boys who will go through the rest of their lives without their mother. While 2 of them have already graduated from high school, one of them is still in middle school. She won't be there as he graduates and goes on to college. She won't get to experience the joys of grandparenthood. She won't get to see her sons walk down the aisle. It's just not fair. Life is not fair. Cancer is a cruel, cruel disruptor of lives. This is a sad week. My thoughts and prayers are with her and her family. It's time for the start of a new school year. The teachers came back yesterday, so things are beginning to get interesting. I am at a different school this year, so we shall see how that goes. My grandbabies are growing, and I don't get to see them near as often as I'd like since they live over an hour away. Justin works weird shifts, also. My Etsy business, Letter Mania, is going really well. We have also begun making things out of old pallets. We are going to set up a space inside a shop downtown to see how things go with that. Jordan is about to start his second year at Snead State Community College. Chase graduated from Snead in May, and he will be going to my alma mater, Jacksonville State University, for the Fall semester. I think he has settled on graphic design/multimedia design as his major...for now. It's a busy time in our lives. I just wanted to write a few tidbits here to try to get this blog thing going again and provide an update on our family goings on. Hello! How's life treating you? It's okay here. We still have our ups and downs, as everybody does. I guess we'll make it as long as our ups outweigh our downs. I'm still working at the primary school, but I'm also running a fairly decent business making wooden letters for people. My Etsy shop seems to be doing okay. I have a steady amount of orders coming in. I really hope it continues to grow, and I can continue to do it. Speaking of growing, my little granddaughters are growing like weeds! Millie is now 3, and Maddie is going on 1 1/2. They are precious! And I'm not a bit biased. ;) Even thought they love Disney movies and Disney princesses, Justin is making sure that they don't miss out on the things he loved as a kid. He has Millie collecting Pokémon cards, and she knows all about The Power Rangers. Maddie is still a little young for all of that, but rest assured, she will know all about it also. They both pretend like they are Power Rangers. Maddie is very good at stomping her foot down and saying, "Heee-ya!" It's so funny. I love those little girls SO much!! Justin is hoping to get a good job around Albertville so that they can move over here. Chelsea completed her teaching degree in secondary English last December. Hopefully, they both can get jobs close by. There are just more opportunities for them around this area. Jordan and Chase are still in college at Snead State. Chase will be graduating with his Associate's Degree in the spring. He plans to transfer to Jacksonville and go into Computer Information Systems...but I'm not sure if he'll stick with that or not. He really doesn't know what he wants to do, but that sounds the most promising right now. As for Jordan, I just don't know about him. I'm not sure he is taking in seriously right now. He procrastinates on big assignments, and that usually gets him into trouble. He is still in jazz band, which pays for his classes. So that's a major plus. And then there's my husband, Kevin. He still struggles with mental illness as a manic depressant, and always will. Some days it's hard, for both him and me. I hate those days so much. But I try to relish the good days. So, that's my life, currently, in a nutshell. I just felt it was time to update and put it all down, even though it's been awhile. I'll get back here and post again one day...hopefully sooner than later. Hello! I thought I'd do an update since I've been away too long. I'm still churning along, working at the school, staying busy, busy, busy. I've started a new business on the side. 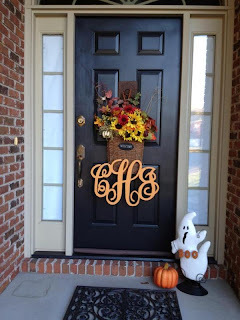 I make wooden letters and monograms for people to hang in their homes and on their doors. It's been going really well, and I plan to set up as a vendor at the local show choir competition in February. 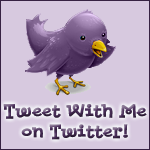 Here's a link to my Etsy shop. You know...just in case you wanted to check it out. Let's see. What's been going on on the homefront? The days of seeing my grandbabies seem to be getting further and further apart. It used to be once every 2 weeks, but lately it's been more like a month at a time. Justin has a crazy work schedule, plus they have been sick with a virus, and we sure didn't want to get that! Little Maddie had an episode that we don't really know what happened. It could've been a seizure, or it could've been that she was choking on something. The MRI and CAT scan came back clear, so hopefully she won't have another one of those. 'Bout scared us to death!! I'm praying that Justin will find a good-paying job in this area so that they can move out from boonie country. You've heard of that, right? Sure you have. ;) There are just so many more opportunities for them around here, and it's NOT just because we live here. Although it would be nice to see those babies a little more frequently. Chase and Jordan are going to Snead State. Chase will be graduating with an associate's degree in the spring! Wooo Hooo!! I think he is going to go into Computer Information Systems when he transfers to Jacksonville State University. He has had a hard time deciding what he wants to be when he grows up. I don't know if Jordan has a clue yet. He still has time, though. So it's time for me to get in there and get ready for my 9 to 5 job, more like 8-4. I hope everyone has a blessed day. Chow. Happy Thanksgiving! I'm up early waiting on the turkey to finish up cooking. We stayed up late last night, trying to get ahead on our Thanksgiving dinner. My parents are coming for dinner. Justin and his two girls will be here later this afternoon. They are going to spend the night!! For the first time ever!! I hope they do okay. Justin is spending the night, too, so maybe they will. Chelsea has plans for Black Friday shopping, so we get the benefit of that! I wanted to take a moment to reflect on the things I am thankful for. Today I am thankful for my family, both immediate and extended. I'm thankful for my dear friends and my co-workers. I'm thankful for my home, my marriage, my vehicles, my job, and my health. I'm thankful that my mom and dad are still around. We've had a tough year in my family. My niece lost her 2-year old son in a tragic accident that involved my sister. It happened in October, so it is still fresh on our minds. So, I pray that we all get through this and come out stronger. It will be hard for my niece & my sister over the holidays. I just pray that God will wrap his loving arms around them and comfort them. I pray he will help the two of them to reconcile. And, right now, I'm thankful that there's food in the oven and a family to share it with. Blogger, please forgive me. It's been 3 months since my last post. Ah, well. It is what it is. I thought it was about time for an update, if only to be able to look back at this blog in the future to help me remember things that I may forget by then. Who knows? Maybe I'll find it in me to begin regular blog posts again. Life just seems to get in the way...which is good. Kevin and I have started a new little side business. We are making wooden monograms and letters. Who knew when I broke down and bought him that scroll saw that it would turn into this? Things are going really well, and we have several orders in the works right now. Of course, many people are buying them for Christmas gifts, so I suspect it will slow down after Christmas. But I'm going to enjoy it for now. It's good to give us a little extra moolah for Christmas, because things were looking a little bleak. I asked my boys what they wanted for Chrismas, and they couldn't give me an answer. Well, Jordan did say he would like a phone. And, don't be thinking he's referring to any newfangled phone that's on the market now to replace the one he has. Because he doesn't even have one. You see, we did away with the $300+ cell phone bill that we had. Kevin and I got prepaid phones, and the boys don't have one. They still use their old iPhone for wireless access, but no texting or phone calls. I expected them to throw a fit, but it wasn't so bad. Chase has a job, so I figured he could get his own cell phone plan if he wanted to. Jordan ended up selling his iPhone for some extra cash, which he blew through pretty quickly. So yeah, Jordan wants a cell phone for Christmas. I am NOT getting into another 2-year contract, though. So I'll see what we can come up with. Maybe I can figure out something for Chase. I'm sure he will mention something he would like to have. Today my little granddaughters are coming to celebrate their birthdays! Millie turned 3-years old last Saturday, and Maddie will be 1-year old in a few days. Wow. Time flies. They are so sweet & precious, except when Millie jerks the pillow out from under Maddie's head when her mom & dad are changing her diaper on the hardwood floor! It wasn't pretty. Maddie cried & Millie got a spanking. But you can't have Millie going around doing that kind of stuff to her sister. I mean, we never did anything like that, now did we?! :) They came for trick-or-treating. 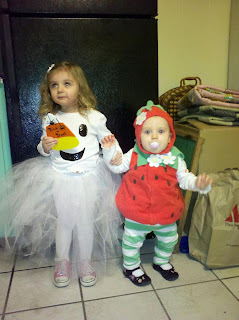 Millie was a little ghost, and Maddie was a little strawberry. Millie would run from door to door & say, "trick-or-treat!" It was so cute. I'm glad we get a holiday all to ourselves, because Thanksgiving and Christmas can get pretty involved. It's so hard to work around all the other family's get-togethers. They just HAD to do their pose with the baby. Thanks for being so groovy & visiting my blog!